Reference number for this case: 20-Oct-54-Raveau. Thank you for including this reference number in any correspondence with me regarding this case. An article in the regional newspaper La Liberté, of Clermont-Ferrand, for October 22, 1954, reported among other observations, that "last night" in Raveau, in the department of Nièvre, Leonard Roumy, deputy mayor of this village, along with several local people, had seen a reddish disk moving south-eastward. As it flew over the town, the craft had projected a bright glow. In 1979, ufologists Michel Figuet and Jean-Louis Ruchon gave a summary with as source the regional newspaper La Montagne for October 22, 1954, and as date of observation, October 20, 1954. We open again, today, the file of the mysterious craft to pour in a really interesting testimony that we collected yesterday. It comes from M. Robert Delavet, driver with the S.A.C.E.R (company of construction and maintenance of the roads) of Clermont. M. Delavet had left, last Tuesday 19 October, at the steering wheel of a truck of his company, to deliver material in the area of Tauves. Mr. Goyon, mechanic, his comrade of work, was at his side. On their return to Clermont, at approximately 11:45 p.m., as the night was very dark and they arrived at the level of crossroads of the road of Bort, before going to Laqueuille-Bourg, their attention was drawn by an intense gleam that seemed to come from a wood located in direction of Bourg-Lastic. But let's hear Mr. Delavat. - Yes, it was in the direction of Bourg-Lastic, or on the train station of Laqueuille. We saw a strong red gleam which seemed to come from a small wood at 500 meters of us approximately. It is rather difficult to evaluate a distance by night. First of all we believed it was a forest fire. I slowed down the truck to try to locate what we believed to be a fire in order to raise an alarm in Laqueuille. We drove gently a few tens of meters more, and at this point in time in a clearing, down the left side of the road, we saw a disc or a ball, producing an intense light, like the rising sun. "We stopped. I turned off my headlights. And during ten minutes we managed to observe it. "It" moved very slowly, on the right, on the left, and up and down almost at ground level. I tell you I was very afraid. We could not stare at it a very long time, because our eyes burned like if we had been welding without protection glasses. We then decided to drive on in direction of Laqueuille, from where all the valley is in view, to continue to observe. But as soon as I relit my headlights the craft disappeared. "It appeared to me to be one meter in diameter approximately. But at what distance were us? It is impossible for me to tell this. "I do not claim anything. I do not say "I saw a saucer or a cigar". That of which I am certain is that I was very afraid and that it was not a jet plane. Having been on military duty in the aviation, I saw enough of them, but none looked like this. Others colleagues at work also saw similar "things"... "
We deliver this testimony without comment to our readers. We only add some words for saying that Mr. Delavet seemed somebody very sensible to us and with "both feet on the ground". M. Léonard Roumy, deputy mayor of Raveau (the Nievre), as well as several people of the locality, saw last night, moving in direction of the south-east, a disc of reddish color. At the time when it flew over the community, the craft projected a sharp gleam. In Chevenon, close to Imphy, Mr. Guy Chevrier, who was accompanied by three people, lengthily saw in the sky a kind of very luminous rocket which crossed the sky at high speed. Finally, near Luzy, a railroad pensioner domiciled in Nevers, his wife and his son, who had visited their family, were overflown Sunday evening, around 8 p.m., by a metallic airship flying at a very low altitude, which projectors light lit the ground as in full day. The craft moved at a tremendous speed. The two ufologists authors indicate that on October 20, 1954, in Raveau in the department of the Nievre, the mayor's deputy "observed at very high altitude a red luminous sphere." The authors indicate that their source is the newspaper "La Montagne" for october 22, 1954. 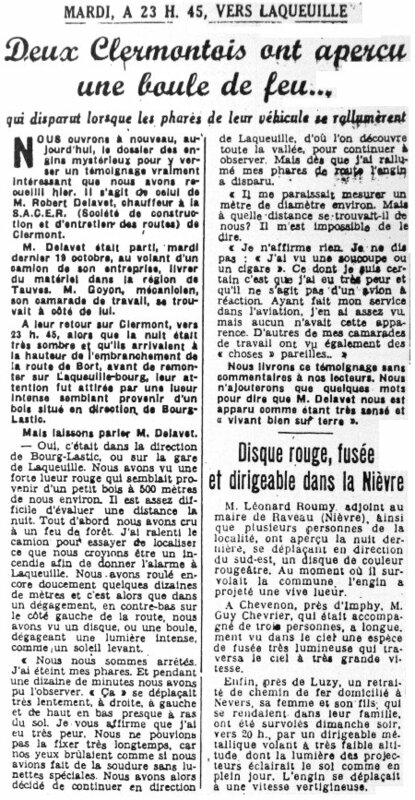 Luc Chastan indicates that in the Nièvres [sic] in Raveau on October 20, 1954 at 08:45 hours "The deputy mayor observed at very high altitude a red luminous sphere." Could be almost anything, including a meteor. [ll1] Article in the regional newspaper La Liberté, Clermont-Ferrand, France, page 2, October 22, 1954. [---] Article in the regional newspaper La Montagne, October 22, 1954. 1.0 Patrick Gross January 21, 2009 Conversion from HTML to XHTML Strict. First formal version. Addition [ll1]. 1.2 Patrick Gross April 19, 2019 Addition of the Summary.